Interested in the PopcornFlix Kodi addon? This guide will show you how to install PopcornFlix on Kodi so you can access a wide range of free movies. Kodi is one of the most popular media center software packages available. It’s highly portable and can be installed on a wide range of popular devices including any new Apple TV, all Amazon Firestick devices, or even a simple USB thumb drive. One of the things that makes Kodi so appealing is that there’s very little functional disparity between platforms. In other words, if something works on the desktop version it’ll likely work on mobile devices too. Kodi doesn’t come with any content when you first install it. There are two ways to add some. First, you can import locally stored video and audio files. This works well on desktop systems because no internet connection is required and storage space is rarely an issue. However, mobile platforms tend to have smaller amounts of onboard storage and this can quickly be consumed by just a few video files. Instead, these devices generally use addons: Kodi plugins that provide access to media that’s hosted online. PopcornFlix is one such addon. It has a large library of movies that are completely free to watch. This article will explain in more detail what PopcornFlix has to offer. 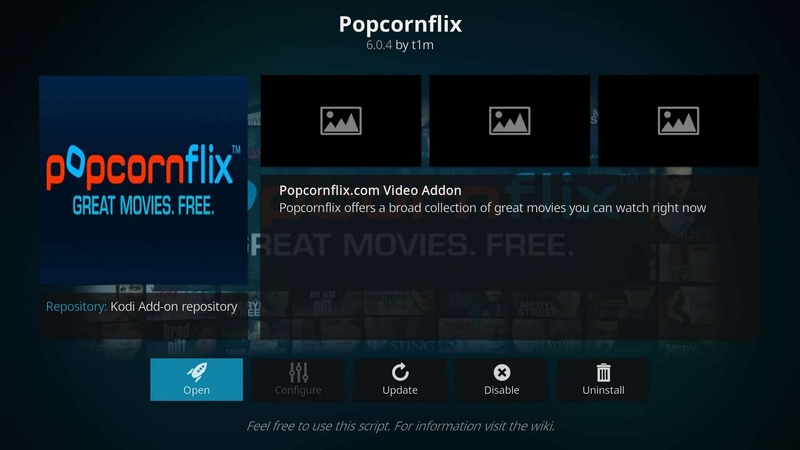 We’ll also be walking you through the process of installing PopcornFlix on Kodi step-by-step. Some Kodi users employ a virtual private network (VPN) to hide unlicensed streaming from their internet service provider (ISP). That said, a VPN can also greatly benefit people who only stream official content with Kodi. Because a VPN encrypts your network traffic, your ISP won’t be able to use your browsing habits to justify throttling your connection. Additionally, this encryption may prevent many Man-in-the-Middle attacks and protect your sensitive information even if you are already compromised. Every VPN will slow your network speeds to some degree. Streaming is fairly data-intensive and requires the fastest connection possible. This means that for the best experience, you should find a VPN with the lowest impact upon your speeds. We recommend IPVanish. It’s a VPN that provides fast, stable connections to servers in more than 50 different countries. IPVanish is among the most portable VPNs we’ve tested and can easily be installed on many platforms including Android, iPhone, and Amazon Firestick. READER DEAL: save up to 60% on an IPVanish plans here. 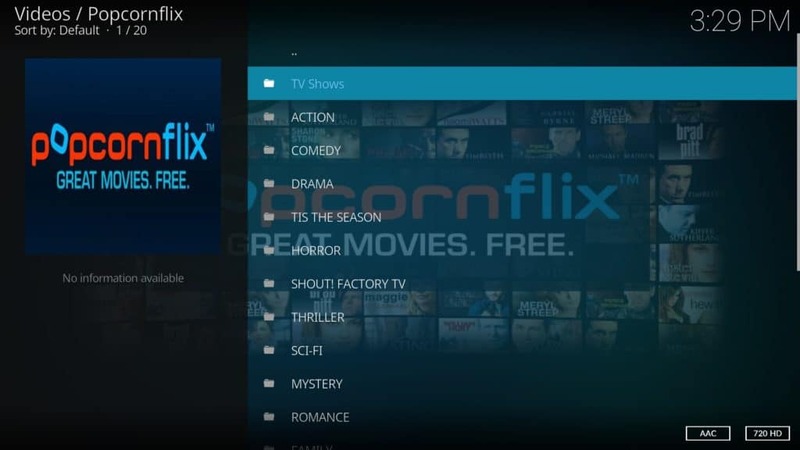 What is the PopcornFlix Kodi addon? PopcornFlix is a streaming platform that offers free access to a wide variety of movies. The web-based version uses ads to generate revenue, but these ads are not present in the official Kodi addon. This means that there should be nothing to distract you from watching all the content you want. The PopcornFlix Kodi addon is fairly simple. It doesn’t have any configuration options and has no search function. That said, it’s relatively easy to find something interesting to watch because all of the content is grouped by genre. Interestingly, while both the Kodi addon and website offer TV shows as well as movies, there aren’t any listed in the TV category. However, TV shows like Peep Show and Detectorists do show up in the comedy folder. PopcornFlix has one of the strongest selections of Spanish content we’ve seen. There are very few Spanish Kodi addons available and most of them focus primarily on unlicensed content, so this is an excellent alternative. It should be noted that most of these titles are in English with hardcoded Spanish subtitles, but considering PopcornFlix is free it’s hard to complain too much. Most addons that offer free movies usually contain mostly public domain or independent films. While PopcornFlix does have its fair share of these, there’s also a wide range of well-known movies. For instance, PopcornFlix is the only free, official source to watch titles like The Girl with the Dragon Tattoo or Terminator 2: Judgement Day. Currently, PopcornFlix is only available in the US and Canada. This means that you’ll need a VPN to watch any of its content from elsewhere in the world. Just connect to a North American server and videos should play without any problems. Usually, you’d have to install a repository before installing an addon. This isn’t necessary in this case, though, because the PopcornFlix addon is included in the official Kodi addon repository. As a result, installing PopcornFlix is very simple. To begin, click the Add-ons tab on the left of Kodi’s main page. Next, click the box icon in the top-left of the screen. Because the Kodi repo comes preinstalled, click Install from repository. 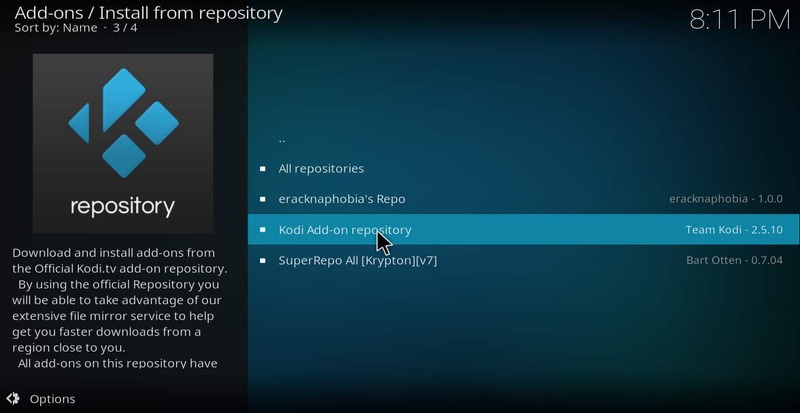 You’ll see a list of all the repos you’ve installed, so scroll down until you see one named Kodi Add-on repository. Go to the bottom of the list and select Video add-ons. PopcornFlix is a little over halfway down the next page. If you have a mouse you can use the scrollbar on the right to move through this list faster. Move down the list until you see PopcornFlix, then click it. Finally, click the Install button. If everything works as expected, you should see a notification in the top-right telling you PopcornFlix installed properly. Kodi is a complex piece of software and can be daunting to the newcomer. There’s no need to worry, though; we have articles to help out if you’re having trouble using Kodi, installing a VPN, or just finding the best addons. At the very least, PopcornFlix is now installed and you have a wide selection of Kodi movies and TV shows at your fingertips. Why stop there? We have articles on the best official addons for sports, cartoons, and live TV to help you expand your media library even further.